Scientists have yet to actually observe dark matter in the flesh, but most research up to now posits it’s the kind of stuff that clumps up and aggregates into unwieldy masses around the universe. New research, however, suggests quite the opposite: dark matter is smooth as hell, distributed more evenly throughout space than we thought. What makes dark matter so important? It makes up about 27 percent of matter in the known universe. This is critical, because when we study the movements of stars and galaxies throughout space, we notice they sometimes move in speeds and directions that can’t be accounted by the gravity of other celestial objects in the vicinity. Even the movement of light is sometimes aberrantly bent. So something must be causing these objects to move in strange ways. 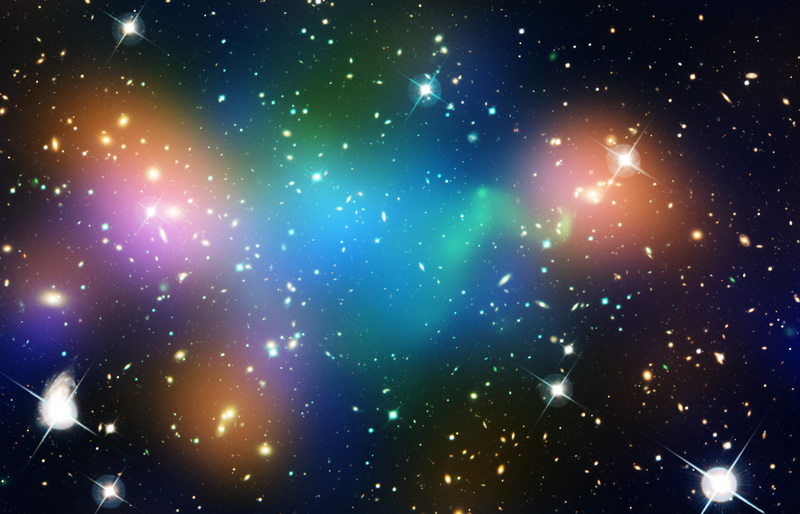 And for most of the last century, we’ve assumed that was dark matter. But our characterization of the elusive stuff was that it mushed up into very large chunks localized in certain regions of space. That paradigm might be shifting soon. An international team of researchers analyzed a trove of data collected by the European Southern University’s VLT Survey Telescope (VST), located at the Paranal Observatory in Chile’s Atacama Desert, to study light from 15 million distant galaxies affected by dark matter. The new results, running in contrast with 2013 results from ESA’s Planck satellite, suggest we were wrong about dark matter. “This latest result indicates that dark matter in the cosmic web, which accounts for about one-quarter of the content of the universe, is less clumpy than we previously believed,” said Massimo Viola, a researcher at the Leiden Observatory in the Netherlands who co-led in the study, in a news release. In studying the warping of light emitted from distant objects, the research team was able to create a proxy method for determining which pockets of space contained the largest sums of dark matter. And to their surprise, they found that it is significantly smoother than what the Planck satellite first found. On its own, this is not much more than a cool new discovery in a little-known field of astrophysics. But the results also highlight the discrepancies that often rise in science. It will be incumbent on future missions like the Euclid satellite and other telescopic endeavors like the Large Synoptic Survey to help confirm if dark matter is smooth or chunky peanut butter. Let’s hope for smooth or else forget about it.